I want to like you. I really do. Your blushing cheeks, your round perfection. Your peppery bite that gives a spicy twist to every encounter. But there's that harsh edge to you that's always held me back. Though other people can't seem to get enough of you; so I keep thinking it's me, not you. After all, it just wouldn't be spring without seeing you out in the garden, the way you reliably pop out of the soil within a couple of days of poking your seeds in the ground. Then I heard about a way to mellow out those rough edges, even make you slightly sweet without totally losing your crisp appeal…I think we may have a future together after all. How about it? Preheat oven to 400°. Separate greens from the radishes. Set the greens aside, wash radishes and dry with a towel. Place in medium bowl and toss with enough olive oil to coat. Place in baking dish and sprinkle with salt and thyme sprigs. Roast in oven for 20-30 min. until skins are crinkled and radishes are tender when pierced with a fork. 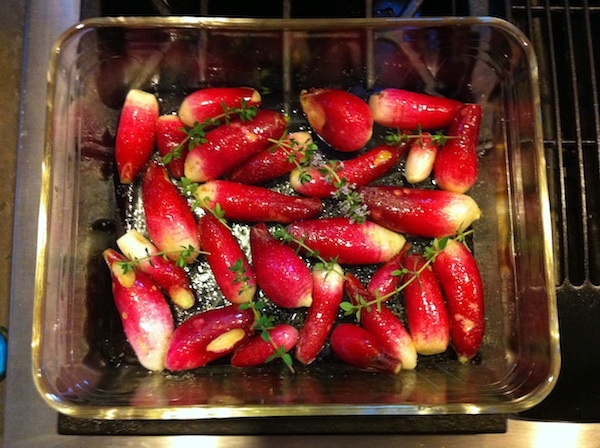 While radishes roast, bring a pot of water to boil on the stove. Wash and dry greens. Put greens, parsley, garlic, pine nuts and salt in bowl of processor. Turn on processor and drizzle in olive oil, processing until mixture is smooth and slightly wet. Pour into medium mixing bowl and stir in cheese. Cook pasta till al dente. Drain and mix in half of pesto or enough to generously coat pasta. 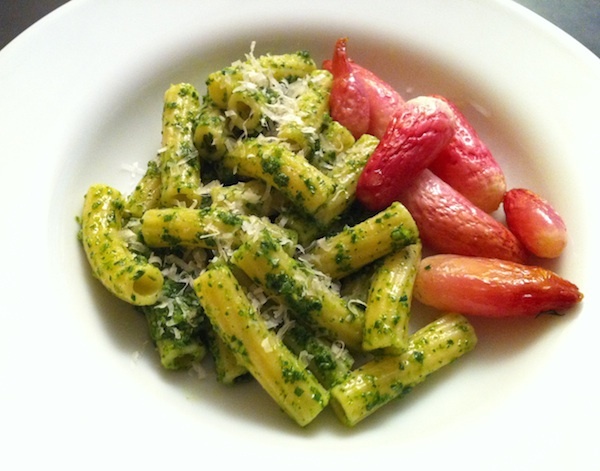 Serve with roasted radishes alongside and extra parmesan for sprinkling.